Betsafe is introducing its customers to a completely brand new and hypnotizing Live Casino experience through its ‘Dream Catcher’ game. The game comes with a sign up bonus for newly registered customers. The promotion which began on 5th January this year is expected to end on the 31st of December this year. 15% for all the Live Casino games except for Dream Catcher which is 50%. 10% for all Casino Stud, Caribbean Stud and Roulette (except Live roulette) games. 5% for all the BlackJack games (except Live BlackJack), Punto Banco, Beat Me, Pontoon, Video Poker and Baccarat games. 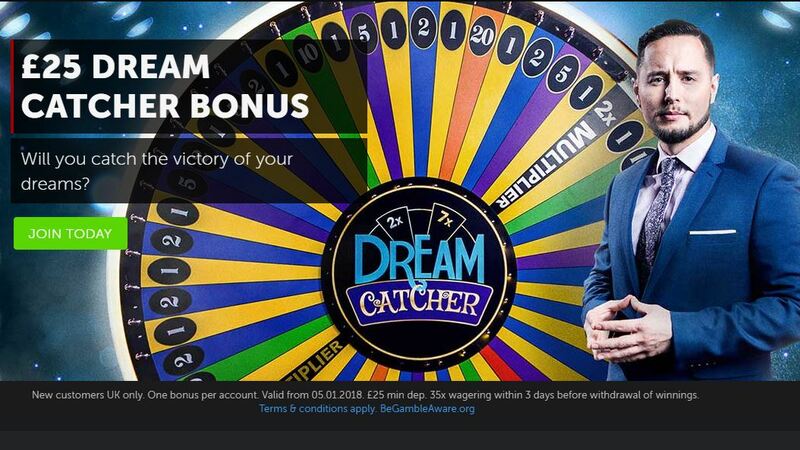 The deposit bonus can be wagered only on the site`s ‘Dream Catcher’ Live table. All winnings received from the bonus money shall remain as bonus money and the money cannot be withdrawn unless all the requirements for wagering are met. Also, when playing the bonus, you have to play with the real money first before using the bonus cash. Finally, any form of fraud or abuse is prohibited. Betsafe.com has the right to ban any player from the promotion in case they are found guilty. Find all current bonuses here.